Congress on Saturday said that if any political party is accused of any scam, it is the duty of the Central Government to expose all the evidence in front of the public. NEW DELHI: With the Central Bureau of Investigation (CBI) turning the heat on Rashtriya Janata Dal (RJD) Chief Lalu Prasad Yadav, the Congress on Saturday said that if any political party is accused of any scam, it is the duty of the Central Government to expose all the evidence in front of the public to maintain transparency in the system. “Be it Central Bureau of Investigation (CBI), Electoral Department (ED) or Income Tax department, they are government agencies and it’s their duty to investigate a case. They have every right to investigate or raid an area. If any political party is under speculations then it is the duty of the Central Government to put forward every possible evidence so that the public also sees the transparency in the system,” Congress leader P. L. Punia told ANI. He added that if anybody is found guilty in any such cases then there is a judicial process for that and the culprit must be punished accordingly. “When it comes to law and order, we are no one to interfere. But from the last three years we have seen that the Central Government is trying to use the CBI to accomplish their political agenda over the Opposition,” he asserted. Yesterday, Lalu held Prime Minister Narendra Modi and Bharatiya Janata Party (BJP) president Amit Shah responsible for the raids conducted by the CBI at 12 locations across Patna, Delhi, Gurgaon. Lalu said that he would eradicate the BJP for interfering in the grand alliance of his party with the Janata Dal (United) (JD(U)), adding he would do everything to break the arrogance of Prime Minister Modi. "With illogical statements, the BJP Government is trying to destroy the alliance of the RJD and the JD(U). We will eradicate the saffron party as they are trying to interfere in our alliance. Listen Modi and Amit Shah, I and the public will break your arrogance even if I have to get hanged for that," Yadav told media here. "I have made you (Prime Minster Modi) walk away from Bihar and you are trying to create disturbances in our alliance. I will break your arrogance," he added. He added that there was no reason to involve Rabri Devi and Tejaswi Yadav in the investigation as his wife is "not even a public servant." 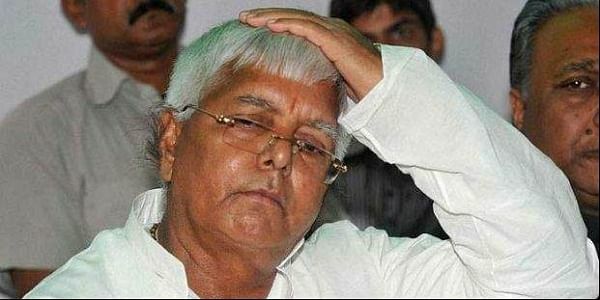 The CBI, earlier, registered a corruption case against Lalu; Rabri Devi; Tejaswi Yadav; former Indian Railway Catering and Tourism Corporation (IRCTC) Managing Director P.K. Goyal; and the wife of Lalu's confidante Prem Chand Gupta, Sujata on allegations of awarding the tender for development, maintenance and operation of hotels in Ranchi and Puri in 2006. The CBI later questioned Lalu Prasad Yadav's wife and former Bihar chief minister Rabri Devi and his son and Bihar Deputy Chief Minister Tejaswi Yadav. The investigative agency also conducted searches at 12 locations across Patna, Delhi, Gurgaon and other places. The RJD chief, however, brushed aside the allegation and tore into the BJP, saying that it was a political conspiracy against him. Meanwhile, the Enforcement Directorate today conducted raids on Lalu Prasad Yadav’s daughter, Misa Bharti’s residence in Delhi, in connection with an ongoing money laundering case. One farmhouse in Delhi and one bungalow in New Friends Colony, Delhi are also attached. The I-T department had conducted raids and surveys at about 22 locations in Delhi and adjoining areas in connection with alleged benami deals of Rs. 1,000 crore by Lalu's family.